There are many things to do when you get to Amsterdam. It is totally normal to feel completely overwhelmed! 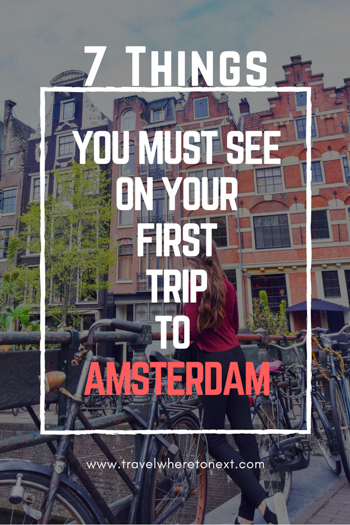 Below are 7 things I don't think you should miss when visiting Amsterdam. A floating flower market that is an absolute stunner. Don't miss walking down the gorgeous street. Any canal you visit will have some pretty spectacular views. If you get good weather, enjoy the day and take in the views. Houseboats are a (strange) way of life here in Amsterdam. There is also a houseboat museum you should check out if you have time! The Rijksmuseum is packed with tons of impressive art. I spent a whole day here and barely saw a fraction of what this museum has to offer. Another museum not to miss it the Van Gogh Museum across from the Rijksmuseum on the Museumplein. All of April you can find gorgeous tulips around Amsterdam. I also rented a car and drove out to the fields and highly suggest not missing this bucket-list experience! Don't miss out on visiting De Looier Antiques Market while in Amsterdam. This enormous market hall is filled with tons of antiques in ever category and price range imaginable. You can find the hall at Elandsgracht 109, 1016 TT Amsterdam, Netherlands. Dampkring is my favorite coffeehouse in Amsterdam and one of the main reasons is Bowie! I first met Bowie back in 2013 and I always make a point to see him every time I am in Amsterdam. Guide on how to meet Bowie here. Of course there are so many more things to see while in Amsterdam but these are things I don't miss whenever I visit. What spots do you love in Amsterdam? Leave a comment below so I can check them out next time I'm there!